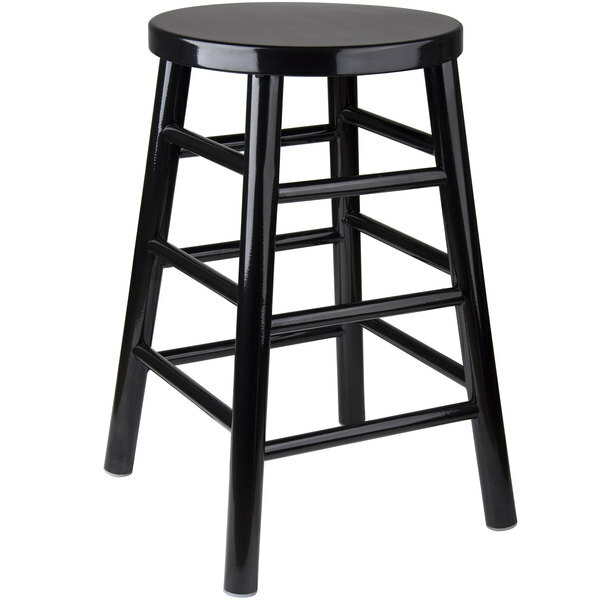 Serving as a reliable and sturdy seating solution for your restaurant, diner, or bar, this Lancaster Table & Seating Spartan Series black 24" metal stool provides exceptional comfort for all your guests and patrons. The item combines the tough and rugged construction of metal with the subtle elegance of an attractive black finish in order to instantly upgrade the look and feel of your foodservice facility. While wooden stools are normally fastened with wood screws and glue, this innovative stool instead boasts reliable, high quality welding for long-lasting support. In addition to a 330 lb. weight capacity, a series of rungs are incorporated throughout the space below the seat to offer increased stability and provide varying levels of foot rests for added customer comfort. Plus, gliders are attached to the bottom of each leg to protect your floors from scuffing. A 24" height allows for exceedingly versatile use, as the barstool is designed to accommodate all your guests in superb, one-of-a-kind style.